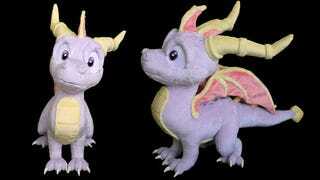 Spyro the Dragon in adorable plushie form. Spyro the Dragon in adorable plushie form. Created by Chibi-pets, it measures 18 inches by 25 inches—it's fairly big, as the two real-world photos show. Those are below, along with a hi-res image showing a couple more angles. There's also a lot more plushies to check out at Chibi-pets' deviantART and Facebook pages.